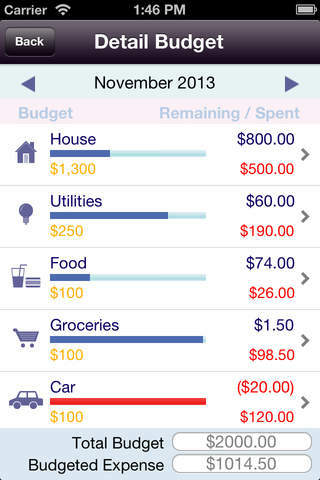 MoneyPad - Personal finance manager to track your budget, expenses, income, accounts plus bills reminder is an iOS app developed by HAIYING LI. 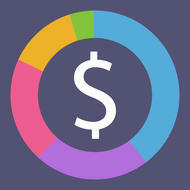 This is a good app to keep money. 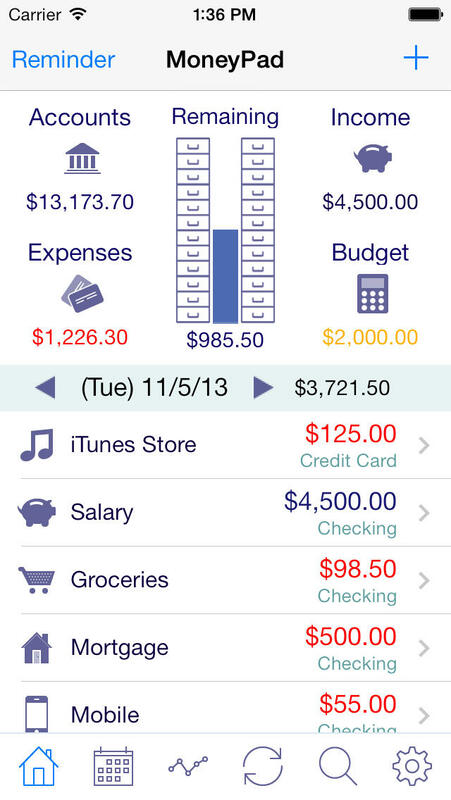 Featured by Apple in "Staff Favorites"and "What's Hot"lists If you are looking for a smart, easy to use and feature-rich financial App to control budget/spending, track bills, replace paper checkbook, manage income and track as many accounts as you want, MoneyPad is the one. With MoneyPad application, you can reconcile transactions, transfer funds, view graphs & reports, export data etc. 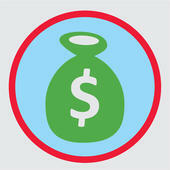 "All in all, MoneyPad is a highly recommended app to keep track of your finances." 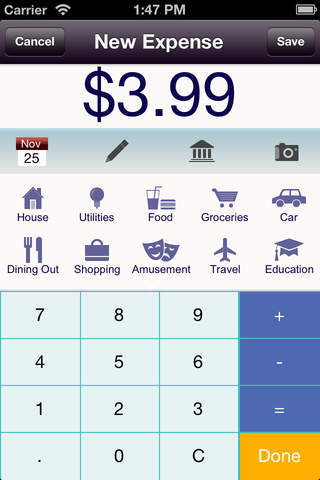 --- CRAVEONLINE.COM "Keep track of your spending and income, bills, budget, and monitor multiple accounts via a user-friendly interface." 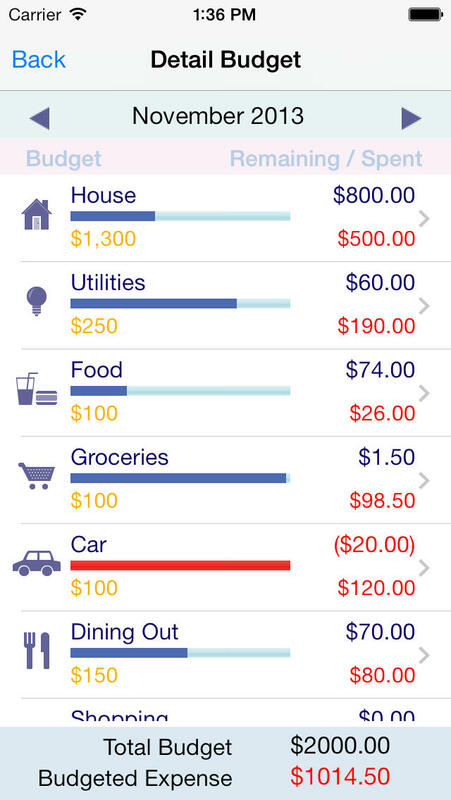 --- LIFEHACKER.COM "When developers make it so easy to track your expenses I suppose there’s really no excuse for not getting on board." --- iPhoneMom KEY FEATURES: Support two color themes Passcode protection. Global currencies supported. Can add photo for transaction. Calendar view of transactions. Ability to customize categories and subcategories. 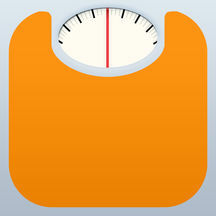 200 icons for categories and subcategories. Export CSV report of transactions by e-Mail. 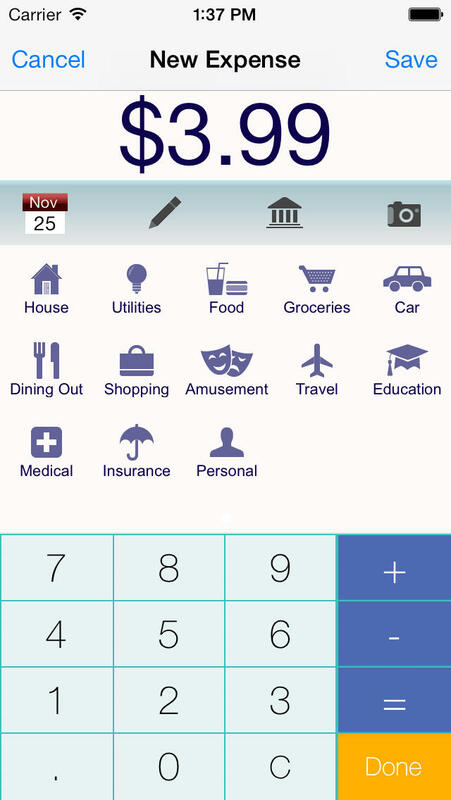 Number Pad with calculation. Search function provided. 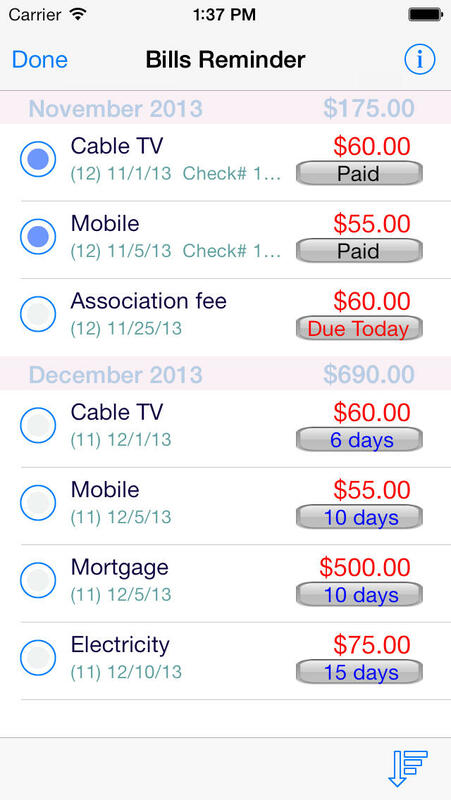 Bills reminder to track your payments. Auto Increment Check#. Enter the first check number and MoneyPad will suggest the next one. Built-in User Guide and FAQ. 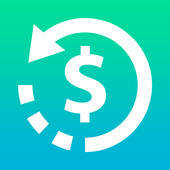 Support passcode delay Sort bills list by time Budgeting Real-time statistics for spent vs. remaining budget. Based on last month's budget, budget rollover automatically on the first day of new month. 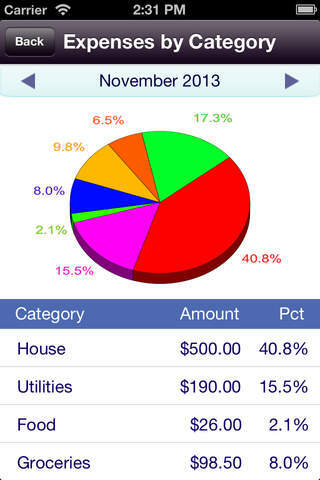 Expenses/Income Create, add notes and organize by categories. View totals per category/date and overall. 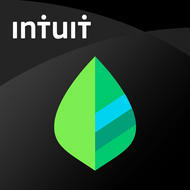 Accounts Ability to create separate accounts for your cash, bank accounts, credit cards, and assets. Multi-currency support. 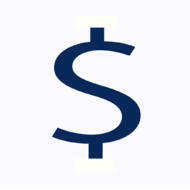 Each account can have different currency with user-input exchange rate to home currency. 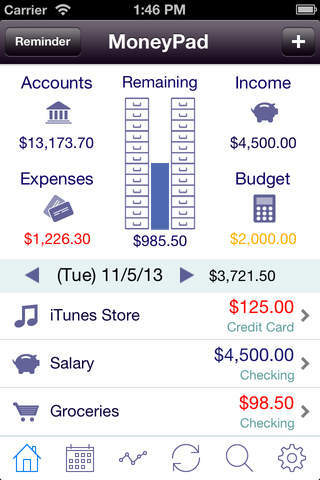 Reconcile your transactions by editing cleared/un-cleared status to see where you stand. 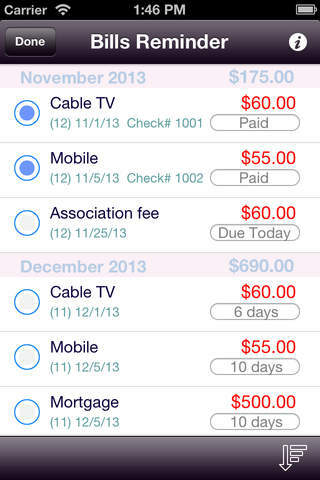 Recurring & Bills Create, add notes and organize recurrings by expense, income and transfer. Ability to set reminders . Local Notifications Get reminded when your recurrings are due. Vendors Ability to create, edit and delete Vendor. Track vendor information including account numbers, websites, and phone numbers. 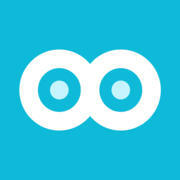 Backups/Restore Backup your data in one tap and email the backup file to yourself for safekeeping. Import backup data via WiFi or iTunes file sharing. 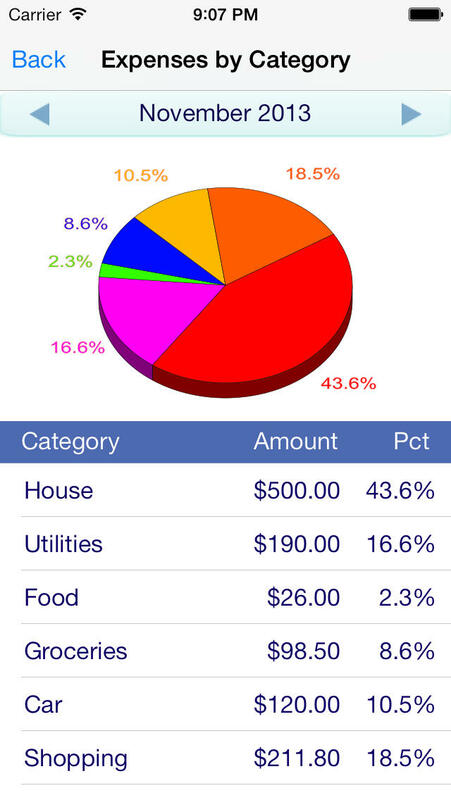 Charts and Reports Interactive 3D Pie charts for expense/income/assets/ liabilities break-down. Trend chart for expense and Income for the last 6 months. NOTES: This app doesn't access your privacy and all of your data are stored only in your device. Send your comments/suggestions to bluemobilecloud@gmail.com or visit our website. "Surely you have experienced problems of the amount of money spent or e..."
"The world’s most effective weight loss program just got even more fun...."